In early January I got contacted by JORD Wood Watches. They found me through my Instagram, and wanted to send me a watch. I was a little skeptical. I get emails for free stuff on a semi-regular basis. You might remember the time I agreed to review cut resistant gloves. Quite frankly, after that article, I was surprised to still receive emails requesting I review people's stuff. But they still come in. Most of them have little to do with what my business or this blog is about. These watches felt kind of relevant. Jord's generous offer brought into clarity a slightly fuzzy thought that has been bouncing around my head for a while. That there's something special about wood. I've got several half-written blog posts on the subject. They're all attempts to communicate this feeling that I have about things made out of wood. Looking around my home, I'm surrounded by wood. There's the walnut flooring, bought locally from a bloke off Craigslist and installed by my wife and me. The cherry table I'm sitting at was made by a gentleman whose workshop is about two hours from where I am now. The oak beam in our kitchen is reclaimed barn wood. Also locally sourced. The cherry bar top under the beam is from a Madison tree. We have walnut speakers, oak kitchen counters, a wood fired stove. And that's before you start opening draws and cabinets in the kitchen. Wooden spoon, spatulas, ladles, spreaders, cups, plates and bowls. Recently I was in the market for new glasses. I looked around for wooden frames. Unfortunately, as a simple craftsman, those were out of my budget. Coincidently I've also idly browsed for wooden watches. So when I was offered a free one, I was intrigued. As far as sustainability, a great majority of the wood we use comes from furniture remnants. It takes very small pieces for us to create the cases and individual links so we are able to utilize what would otherwise end up in a waste cycle. Both Bamboo and the Maple we source is completely sustainable, and as is expected in the industry – all of our Koa comes from damaged trees or trees that were brought down by a natural weather event. Moreover, we concentrate on Environmental safeguards as well. All of our watches are treated with natural substances, no hazardous chemicals. Not only for the sake of the environment, but for those who work on the watches. The watches are conditioned with natural tung oil. That’s it! I love that approach. Partly as it's similar to my own. Taking material out of the waste cycle, and upcycling it into something beautiful. I also like that they offer several models with automatic movements. No battery required. The watch is powered by a spring that's wound by the movement of wearing it. Batteries are cool. Better batteries make electric cars drive further, help projects powered by renewable sources of energy and are found in more and more everyday items. However, they often require some pretty exotic materials. Rare earth metals, toxic chemicals and the sort. So to be able to go without batteries, even ones as small as those for watches, is a solid plus for me. As a woodworker, I appreciate that Jord are working to raise the status of wood. These watches are luxury items. And one of their main selling points is that they're made of wood. 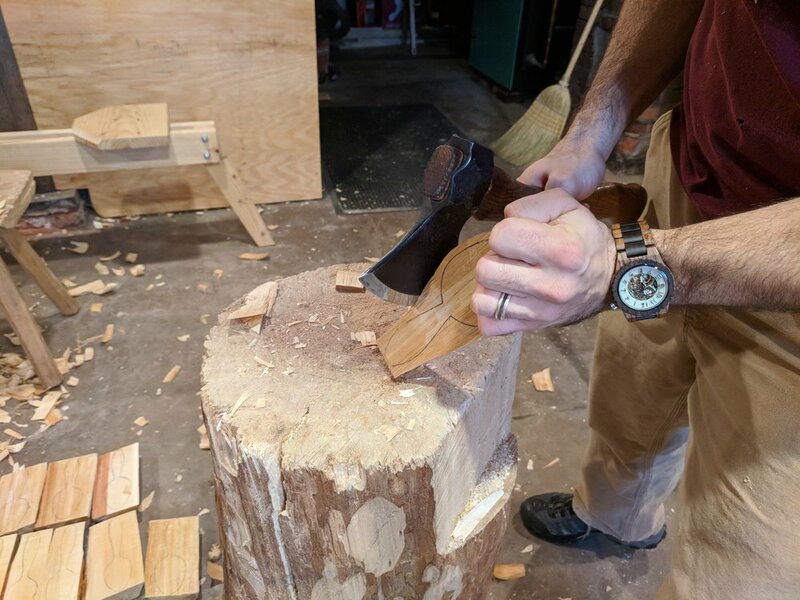 I'm not making luxury items, but I am making things from wood and selling them. Knowing that there's a company like Jord out there, showing everyone how awesome things made out of wood are, is a great thing. 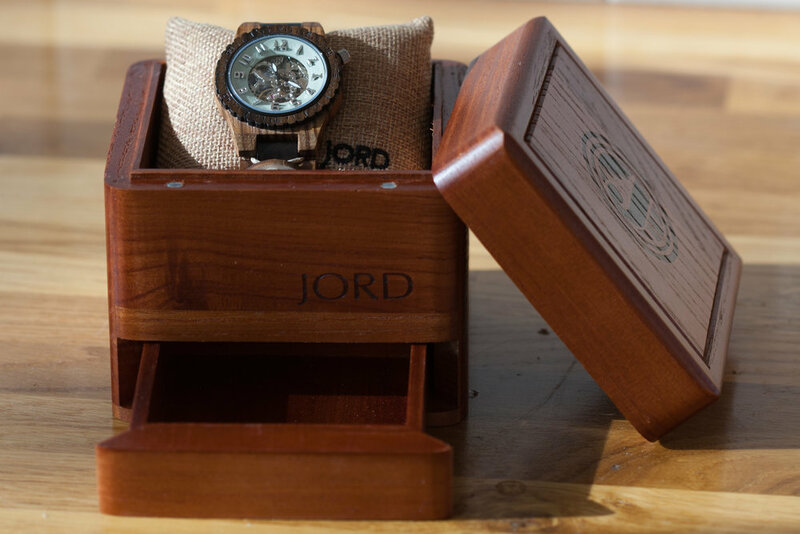 If you want a Jord wooden watch of your own, they've set up a competition for my blog readers. Click here to enter for the chance to win a $100 Jord gift voucher.